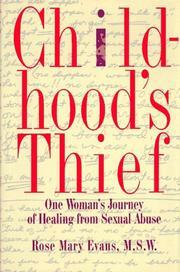  Social worker Evans' gives a compelling account of a client's recovery of a childhood laced with physical, emotional, and sexual abuse. When 47-year-old JoAnn first seeks therapy, she is suffering from a debilitating depression. In the course of analysis, she relives a childhood so devastating that she had no recourse but to completely blot it out. More than just an unwanted burden born to an unwed teenage mother, JoAnn was her mother's living curse. About her father, she was told: ``Your Father? You never had no Father! He left before you were ever borned. He never wanted you, stupid. I was the one stuck with you and NOT HIM!'' JoAnn's grandfather forced her to indulge his sexual appetites and those of his ``friends.'' As JoAnn grew older, she was expected to pay her way with her flesh. She survived by detaching her feelings ``from the mistreatment her body had to endure.'' As JoAnn begins to relive her submerged memories, she experiences a wide range of physical symptoms, even feeling kicks from her grandfather. The reader follows JoAnn's slow emergence from her depression. By the end of the book she is forging a new life for herself, with energy left over to crusade for abortion counseling and against sexual abuse. While we do get a strong sense of JoAnn's bitter childhood, the reader is told about a divorce without any sense of what her marriage was like. There are difficulties with her younger son, but no clues about her other children or her capabilities as a mother. And while the author intersperses JoAnn's first-person narrative with her own comments and insights, we lack a sense of the author (who informs her client and readers that she is gay). The book has an air of tabloid TV, but the human drama here remains powerful.